YAHOO NEWS: They say that nothing succeeds like success. And it was just last week that Psychic Christopher Golden was awarded a "Top Psychic" nod (Yahoo News, Feb 26, 2014). 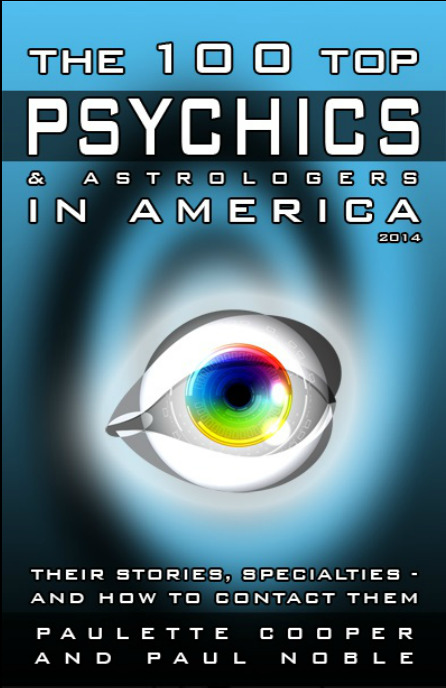 Now the highly anticipated directory, "The Top 100 Psychics in America 2014" was just released, and Psychic Christopher Golden has made the cut. It is the rare psychics, such as Golden, who grace the pages of this fascinating and one-of-a-kind collection, featuring the best of the best. The author, Paulette Cooper is the award-winning author of 20 books. Her most famous of course is her courageous and groundbreaking "The Scandal of Scientology” (1971). In her latest effort, in collaboration with Paul Noble, she has interviewed hundreds of psychics, creating a well researched volume – a veritable “who’s who” of the psychic industry. And who better than a skeptic and a critic of those who would abuse spirituality to manipulate others, to be qualified to envision and execute an ambitious project on this scale? When asked why a book like “The Top 100 Psychics in America 2014” is needed, Psychic Christopher Golden had this to say, “It goes without saying that most gypsies are not crooks. But it would be irresponsible not to mention that too many of the storefront type of “fortune tellers” are in fact gypsy scam artists, who over the course of many generations, have perfected the fine art of telling people what they want to hear, simply to separate you from your money. These frauds are in the emotional transportation business and the fare is due, at the end of the ride, with whatever they can get out of you. This unfortunately muddies the water for those of us who are sincere in our intentions and in service to our gift. And given the anonymity that the internet provides, this ugly side of the so-called psychic world has only gotten worse. A book such as this one is needed now more than ever, for those looking to the metaphysical realm for the kind of insight that the material world cannot offer." Psychic Christopher Golden is located in Beverly Hills, California and is available on the web at: www.Psychic90210.com by appointment only. The Wall Street Journal called him "The Psychic to the Stars" but his primary focus is on matters of the heart. "I was beginning to think I had completely disconnected from the world of dating and intimacy. Too much disappointment had made me cynical. And then I fell in love with someone online. And then, predictably, there were problems. I wanted to give up but my heart wouldn't let me. I was truly in love and it was special and it was all starting to slip away from me. I spoke to Chris for a long time and I felt like I was finally talking to someone who gets it. He agreed to help me, for a fee of course, but it was worth it. Over the course of a couple of weeks he told me what to do and say to put my new relationship back on track and to break the old cycle I'd been in for years. I am happy now. I am not embarrassed that I used a psychic. Christopher Golden deserves this great review. He earned it. I will always be so grateful to him for making me believe in love again."